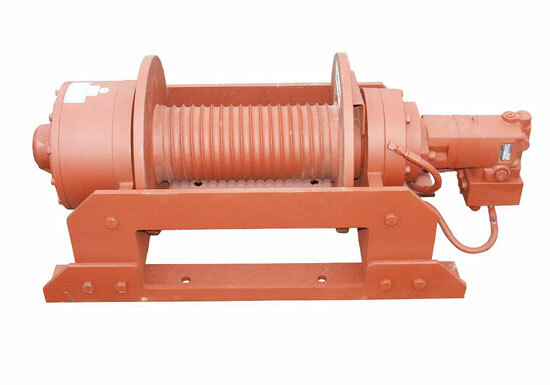 Industrial winch is engineered to lift or pull heavy loads in various industrial sites. It can lift up to 300 tons. 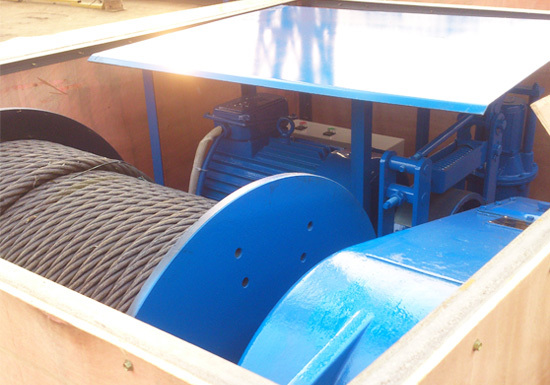 These industrial winches are designed for daunting tasks in factories, mines and marine. They fall in many different configurations to match your business demands, such as electric winch, hydraulic winch, hand winch, slow speed winch, high speed winch and variable speed winch. Our winch can also be customized to fit your specific needs. With so many types of winches out there, it is cumbersome to locate a proper one. 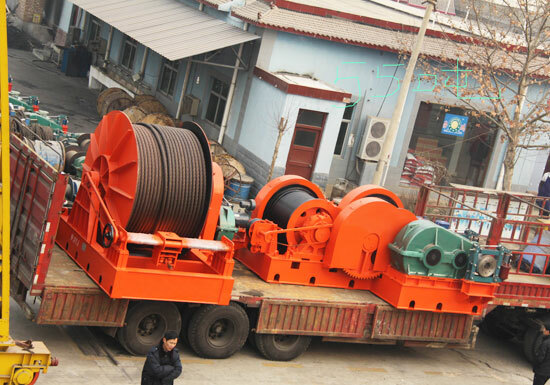 First of all, we will familiarize you with different classifications of winches and their specific uses. According to motive power, it can be divided into industrial electric winch, industrial hydraulic winch, manual winch and pneumatic winch. In the selection of power source for winch, always keep in mind that try electric first since the electric winch can work reliably, efficiently and safely for your applications. Moreover, it has low operational cost and can be controlled remotely. Industrial hydraulic winches are applicable to many onshore and offshore operations that require the most demanding lifting tasks. 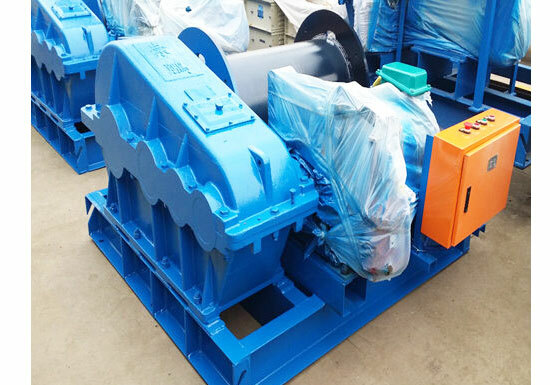 According to working speed, it can be classified into slow speed winch and fast speed winch. 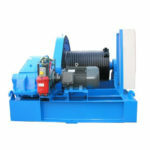 Slow speed electric winch is ideal for many construction and installation projects that require short-distance lifting. 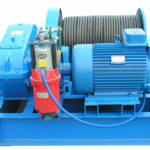 However, if your business requires high productivity, a fast electric winch should be used. It can reduce power consumption at the same time. 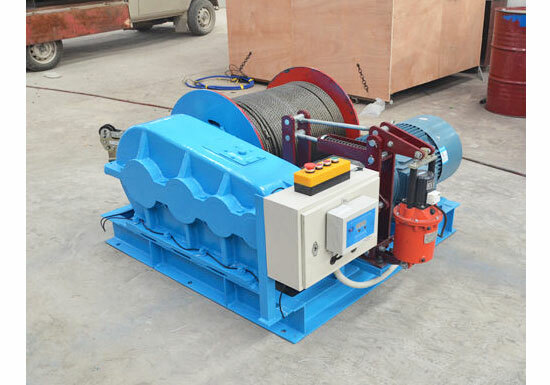 Based on winch drum, it can be sorted into single drum winch and double drum winch. The single drum winch features simple structure, easy operation and transportation, whereas double drum configuration is designed to improve working efficiency and productivity. According to duty cycle, we have light duty winch and heavy duty winch for you to choose from. The selection of a winch is highly determined by your required load capacity, how often do you use the winch and environmental conditions. 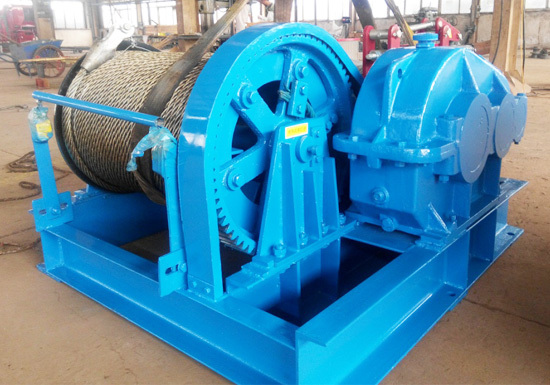 Other types of winches we offer include small industrial winch, industrial capstan winch, industrial hand crank winch, industrial marine winch and industrial portable winch. Each of them has its own advantages and disadvantage with respect to working environments, ease of use and safety. 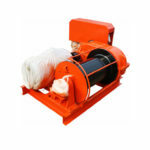 For more details of each winch, contact us online. 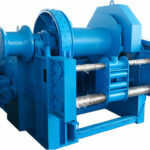 Our experts will help you select a proper type of winch machine for your particular applications. 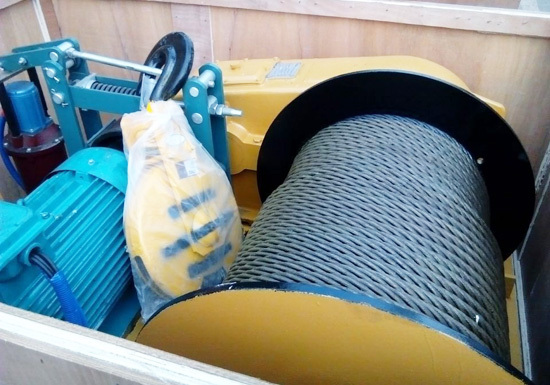 The industrial lifting winch supplied by our company is meant for the utmost efficiency and safety of material handling in a variety of industrial sites. We also offer the most competitive price to our clients. These industrial winch systems come in many different options and accessories to meet your required winch specification. In addition to these options, we offer custom design to make sure you end up with one that works perfectly to your goals. 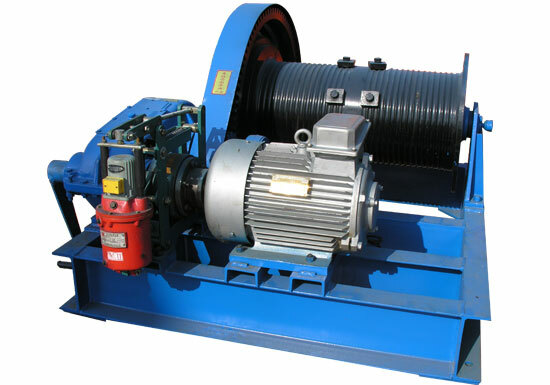 Winch is a very simple piece of machinery incorporating several basic components. You should familiarize yourself with each component so that you can better use the winch. 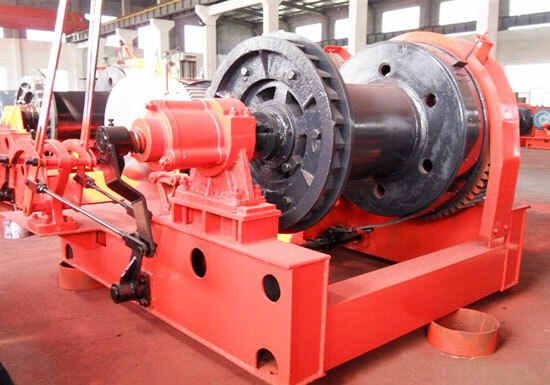 Typically, the motor of an industrial winch is powered by electric or hydraulic. But keep in mind that always try electric first. The winch drum is a horizontal cylinder on which the rope winds. Here comes an importance value related to winching, drum capacity, which generally refers to the total amount of rope stored on the drum. The drum is driven by the motor to rotate so as to wind rope in or out. 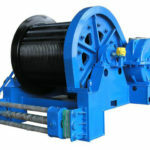 The length and diameter of industrial winch cable is largely determined by rated load capacity. Our winch utilizes reduction gear or planetary transmission. There are two main control options available, standard control box and remote control. The push-button control box is the most basic form of control that can be installed on or near the winch machine. Remote control can be connected to the control box, allowing the operator to stand clear of the rope and load. The industrial winches are mainly designed for lifting and pulling purposes, that is, they deliver two directions of load motion, horizontal and vertical. 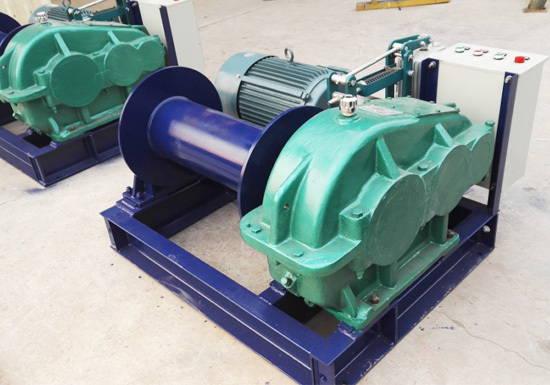 In a variety of lifting applications, electric winch is widely applied for its easy operation and low operational cost. 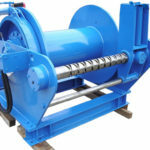 The electric lifting winch is commonly found in construction and installation sites, mines to lift heavy objects. The cable pulling winch is ideal for onshore and offshore pulling operations, such as towing a ship or boat. Especially in many marine-duty applications, a hydraulic pulling winch is applied to various large boats for pulling purposes. Whatever you desire a lifting or pulling winch, we will help you select one that delivers proper balance between suitability, cost and durability. 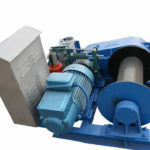 Interested in our winch machine? or want the best prices? 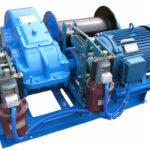 Why Buying An Industrial Winch From Aimix Group? We are very happy to have the opportunity to introduce our products, our company and its strength. With so many industrial winch manufacturers and suppliers out there, we stand out for many reasons. We have over 10 years of experience in winch design, fabrication, delivery, installation and maintenance. So if you are buying a winch from us, you can benefit a lot from our project management experience. 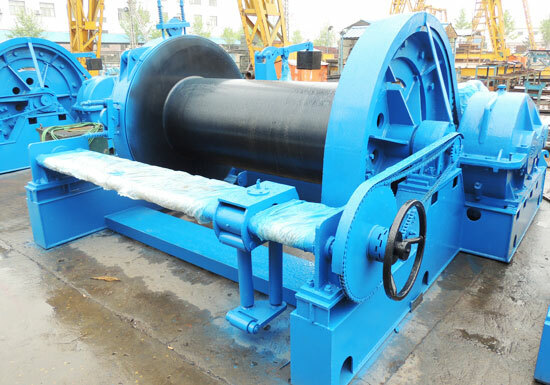 We provide high quality winch products for our clients. Each of our winch is under strict quality control. We also introduce state of art processing facilities to high quality products. We offer the most cost-effective winches to help your business create maximum value. We are able to design a custom solution to meet your specific operating conditions. We also promise to respond quickly to your questions and problems. If you have any question, please feel free to contact us online. To receive an affordable industrial winch solution, get in touch with us now! Copyright 2019 © Aimix Group Co., Ltd. Please give your inquiry in the form below.